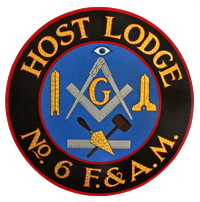 Frequently Asked Questions – Host Lodge #6 F. & A.M.
Freemasonry (or simply, Masonry) is a fraternal order whose basic tenets are brotherly love, relief (philanthropy), and truth. We strive to enjoy the company of our brother Masons, assist them in times of personal trouble, and reinforce essential moral values. There is an old adage that Masonry “makes good men better”, which is our goal. Masonic groups are geographically placed into “Lodges”. A Masonic lodge operates like any other fraternal organization would, with regular business meetings, events, etc. Masonry offers men a good and positive environment to interact with men of good character, thereby reinforcing his own moral development. 2. Do I need to be any specific religion to join a Masonic Lodge? No. Masonry does not practice any religion or creed, but does place some of it’s teachings on a members spirituality. Although a belief in a “Supreme Being” is a requirement for membership, how a man defines or names this Being is up to him. Masonry is made up members from all religions and advocates it’s members to further their spirituality through some of it’s teachings. 3. Are there any Masonic events I can attend as a non-Mason? Absolutely! Any persons desirous of learning about Masonry are encouraged to attend open events. Some of the public events a Lodge may hold are pancake breakfasts, benefit dinners, picnics, fundraising events, ladies nights, and most installations of officers. Any man who wishes to learn more about Masonry should attend events and ask members in attendance, who will be more than happy to impart their knowledge! 4. How can my family get involved with me? There are appendant bodies of Masonry for wives, sons and daughters. There are many events held by Lodges that are open to the whole family and the Fraternity encourages family involvement as a way of getting to know the organization better. Wives can feel free to support their husbands commitment or the lodge as a whole as far as they wish and even have the opportunity to join the Order of the Eastern Star. For sons and daughters, we have the Order of DeMolay and the Internation Organization of Rainbow for Girls (respectively) that are options for young men age 12-21 and for young women age 11-21. Check out the Affiliations tab for a link to more information! 5. Is Masonry a secret society? “Secret Society” is a dangerous term. Secret societies are generally defined as organizations which are unknown to the public and whose existence is denied. Not only is Masonry largely known, it proudly embraces all those in search of knowledge of the Fraternity. Though we do have a few “secret” modes of recognition, this is only to distinguish a Brother from the rest of the community as one who has taken steps to improve his moral character by surrounding himself by like-minded men in Masonry. All organizations have some secrets, and Freemasonry is no different. Membership and Initiation fees will vary from Lodge to Lodge. Typically, there is a one-time fee for the three degrees of Masonry, as well as regular annual dues. All of these numbers are dependent on the Jurisdiction you find yourself in as well as the Lodge (its current roster, lodge building and expenses). For more information, contact the Secretary of the Lodge you wish to join (Host Lodge Secretary information is in the Contact Us Tab). 7. How can I join/what are the requirements? You must be of good moral character and have 3 people willing to vouch for your character. Lastly, you must WANT to join!!! The easiest way to get a petition and more information about Masonry is to ask a Mason. The beginning steps can be found right here on our website! By filling out your information on the Contact Form under the Contact Us tab we will be sure to get you set up with a convenient time to meet with a few Brothers to answer any questions you may have and to start you on your path to becoming a Freemason.